Approval ratings for Brazilian President Dilma Rousseff’s government have gone down by 23 per cent, according to a new poll. The Ibope Institute poll, conducted between July 9-12, surveyed more than 2,000 citizens in Brazilian cities and showed that ratings for the government dipped from 54 per cent to 31 per cent. President Rousseff’s own ratings slipped by 26 per cent. 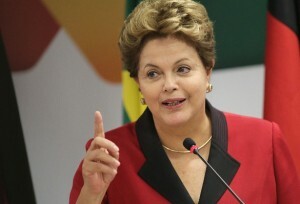 The Brazilian leader holds the second spot in Forbes’s list of the world’s most powerful women, after Angela Merkel. “The fall in the president’s popularity is also reflected in the comparison between her government and that of former president Luiz Inacio Lula da Silva (2003-2010),” said the CNI-Ibope poll. The work of Rousseff’s government is seen to lag behind her predecessor Lula’s work, especially in health and education. Better access to health and education were also the key demands of protestors who took to the streets in Brazil recently. During the protests, Rousseff had proposed a referendum on political reforms to the Brazilian Senate, a move widely supported by the demonstrators. Writing for The BRICS Post, analyst Fernanda Bak said the recent protests were not directed against any particular leadership, although Rousseff had shown citizens that she wanted their voice to be heard. “The core of this revolution does not hinge on who is in charge according to the country’s conventional hierarchy,” she said.